Thanks to increasing efficiency in solar panels, as well as dropping costs for manufacture and installation, generating renewable electricity at home or in commercial buildings is becoming increasingly viable. And this fast-growing trend has been manifesting itself in an impressive list of “world’s largest” projects, with government and industry pairing to make renewable energy a major power source. For example, back in January, the world’s largest solar bridge was completed in London on the Blackfriars Bridge. As part of Blackfriars Station in London, the bridge was fitted with 4,400 photovoltaic panels between 2009 and 2014 – which are expected to reduce the station’s CO2 emissions by an estimated 511 tonnes (563 tons) per year. Considering London’s issues with air quality and mass transit, this is a major step towards sustainability. 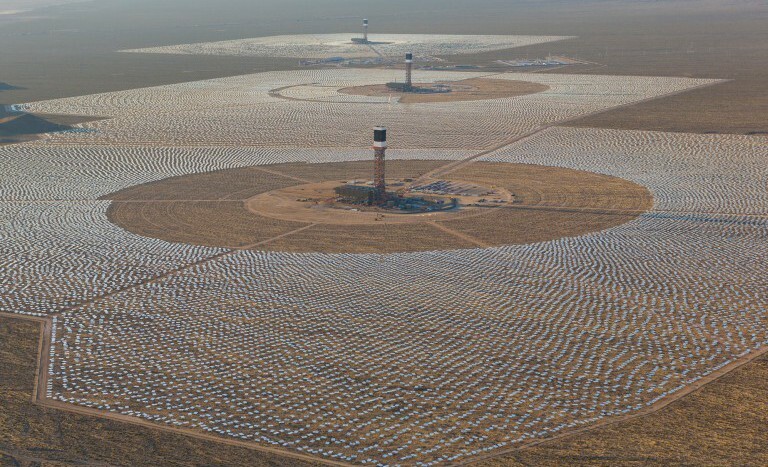 Then in February, the Ivanpah Solar Electric Generating System (ISEGS) – the world’s largest solar-thermal plant – became fully operational in the Mojave Desert in southeastern California. The 392 MW plant, which was developed with funding from NRG Energy, Google, and BrightSource Energy, is expected to generate enough electricity to power 140,000 homes, each year. 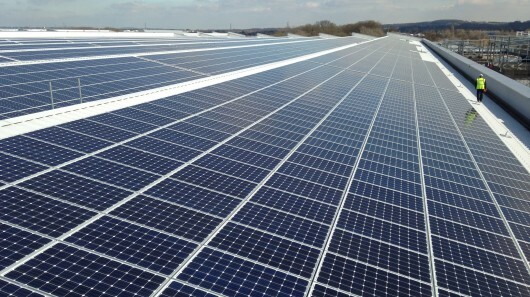 And in April, Jaguar joined Audi, Ferrari and Renault by installing fields of solar panels on top of its new Engine Manufacturing Center in South Staffordshire. This solar field is now the largest rooftop array in the UK, comprising over 21,000 photovoltaic panels and a capacity of 5.8 MW. Jaguar estimates the installation will meet more than 30 percent of the centers energy needs and reduce the plant’s CO2 footprint by over 2,400 tonnes (2,645.5 tons) per year. 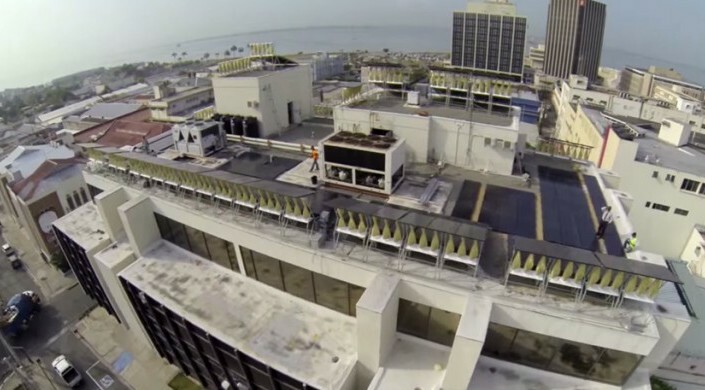 And now, Windstream Technologies – a commercial wind and sun generating firm aimed at bringing renewable energy to municipalities, commercial buildings and homes -has installed what it says is the world’s largest wind-solar hybrid array on the roof of the Myers, Fletcher, & Gordon (MFG) lawfirm in Kingston, Jamaica. The array is expected to generate over 106,000 kWh annually and demonstrates the ability to maximize energy production with limited roof space. MFG’s installation is a part of an effort by Jamaica’s sole energy provider, Jamaica Public Service, to make the capability for producing renewable energy for its approximately one-million citizens more widely available. The array is expected to generate 25kW of wind power and 55kW of solar power, and the electricity generated can either be used, stored off-grid or fed back into the grid. The installation incorporates 50 of WindStream’s SolarMill devices, with each different model comprising one or more solar panel and three or more turbines. This is to ensure that the daily and seasonal trends of wind and solar resources are all mitigated by capturing both at any time of the day or year. Windstream says it will return its investment within four years and will produce savings of around US$2 million over the course of its estimated 25-year lifespan. Merging solar, wind and other renewable technologies into communities, commercial spaces and housing is not only a means of cutting emissions and utility bills, it is also a way to tackle two of renewable energy’s greatest stumbling blocks. These are the problems of storage and intermittency – generating energy when it’s needed and getting it to where it’s needed.